Take a sacred pause to express, feel support, practice self-care and heal in an authentic, safe, non-judgemental and loving space. Let’s bring the traditional ‘Gathering of Women’ back to modern day! 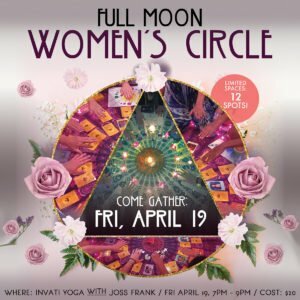 Cozy guided womb-connecting meditation, deep soul inquiry, opportunity to share & listen, journaling, revealing self-limiting thoughts & blocks activity, learn about feminine spirituality, & more! * open to all self-identified women of any and all backgrounds.